Summary from Goodreads: The long path to the throne has only just begun for Aelin Galathynius. Loyalties have been broken and bought, friends have been lost and gained, and those who possess magic find themselves at odds with those who don’t. 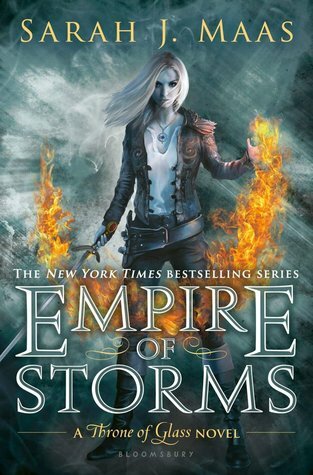 Empire of Storms was AMAZING! I love this series so so much, however I nearly gave this a four stars. I’ll get into that later, but the last 100 pages totally changed that rating, and brought it up at least half a star. That doesn’t mean that I didn’t absolutely love every bit of this book though, because I definitely did! Aelin and her court, Aedion, Lysandra, Rowan, and little Evangeline, are on their way to reclaim Terrasen after the King of Adarlan’s death. But, when Aelin meets with one of Terrasen’s remaining Lords, she is informed that all of them agree that Aelin is a princess by birthright, but cannot become Queen. Instead of continuing towards Terrasen’s capitol, disaster comes in the way and Aelin must rush to fight off the Valg and Maeve’s army. Meanwhile, Dorian is in Adarlan learning to use his powers when Manon and the Ironteeth come into sack Rifthold along with other witch clans. They end up joining forces with Aelin and her court to continue fighting the Valg to save Erilea and their countries. Aelin is as sassy and snarky as always. I love her character so much, and she’s really grown a lot over the course of the past six (including Assassin’s Blade). Aelin is so tough and so deadly, too. You really wouldn’t expect to love an assassin like her so much, but you can’t help it. Aelin has to be one of my favorite female characters EVER. Her fire powers are amazing and so cool! I really enjoyed getting to know more about her powers and just how powerful and rare they are. Rowan, our main love-interest, is a great character as well. He’s always there to protect Aein, but not just Aelin. He cares about her so much, and would risk his life for her, or really any of her court members because of it. Rowan isn’t my favorite character, and I don’t love him as much as everyone else, but that doesn’t mean I don’t like him. He’s a great character, and like Aelin, has grown so much since he first appeared. Dorian (my favorite) is struggling with his powers, which are making him more tough and ready to fight than ever. He’s not the sweet little book and puppy loving Dorian he was in the first book. I miss that Dorian for sure, but his character growth is wonderful. I really wish he got more page time though. Still, I absolutely love Dorian and he’s one of my favorite characters ever. I love Lysandra as well. I can just remember in The Asassin’s Blade when her and Aelin were enemies, but now they’re so close. The fact that she can shape-shift is so cool. She’s always surprising people with the fact that she can shift and turn into anybody or any animal. Lysandra is super tough and strong like Aelin, but she’s even snarkier and sassier. Probably from all she’s gone through though, it’s made her just so strong when most people would be so broken. I love Lysandra’s growth as well, and she continues to be a favorite of mine, even though she really only came in in Queen of Shadows. Then there’s Aedion, Aelin’s cousin, who you can tell is still upset about the blood oath, but tries not to let it get to him. I kind of felt bad for him in the previous book when he realized Aelin got the blood oath with Rowan because they always promised each other they would. Aedion doesn’t really mind as much anymore though. He’s super loyal to Aelin and will always be there to defend her along with the rest of her court. I love Aedion so much. I feel like he’s always just there to kind of guide people along and inform them of things they missed out, but is just super cool and loyal and awesome, and I love him. Manon continues to be amazing. If you thought she was scary in HoF or even QoS, she’s way scarier here, but I loved it. Her character has developed so much, and she’s really grown into a super strong person. Manon will go to lengths to protect those she cares for, her Thirteen mainly (I love how close Manon is with all of her thirteen). Just the thought of losing them scares her so much, you can just tell that she really loves and cares for her Thirteen. All that aside, Manon can be super scary and strong. She isn’t willing to sit around and do nothing, she wants to put up a fight and will do whatever she can. I love how determined she is. Of all the characters though, Elide has by far grown the most Remember in Queen of Shadows when she was so scared and nervous? Complete opposite now. She’s learned to stick up for and defend herself, and isn’t afraid to either. She’s determined to find Celeana/Aelin and will stop at nothing to do so. I really liked the relationship she had with Lorcan, who joins with her in the beginning. Lorcan still believes he has the key and remains very loyal to Maeve throughout the book, but also really grows to care for Elide. There are SO many relationships in this book, and guess what? I love them all! Rowan and Aelin are very much in love, and I really like the relationship those two have. They went from hating each other, to really loving and trusting each other. Their romance felt very real and not forced. I don’t really want to talk about any other relationship though because of spoilers. Aelin and Rowan were basically together already though, so. I will say that I really liked all of the romances in this book and none of them felt forced to me, despite what many people have been saying. The plot was really faced past and fun! But, the reason I took off .5 of a star was because I just got really bored between like pages 450-550. I was dreading finishing this book for a while, but once I hit page 550 it really picked up and I couldn’t put the book down. A lot of stuff happens in this book though. There’s so many different characters that are so important to the story so we have a lot of POVs. Another thing I had a hard time with were all the action/fight scenes When multiple people were involved, the POVs were constantly changing and it was just so confusing sometimes. I get why Maas does it. If there are multiple characters in a fight scene, you want to know what they’re all doing ,but constant POV switching can be hard to follow and confusing in my opinion. “It’s mine,” Aelin said. They all looked at her. She let out a humorless laugh. Other than that, I love Maas’s writing. It’s descriptive but not too descriptive, and it gets to the point. There are some fantasy books (or just books in general) with super pretty flowery writing but it can often be confusing and hard to follow. That’s not the case here though, at all! I wouldn’t even describe her writing as beautiful to be honest though. And I’m not saying that in a bad way, it just doesn’t fit in my description of “beautiful” writing (super metaphorical descriptions, etc.) She has a clear voice for all of her characters though, and it always makes me so happy when authors do that. Like I said, it can be confusing when the POV switches like every page or two, but it doesn’t do that often. When that’s not happening, you can always tell what character the POV is in because they have such clear and distinctive voices in my opinion. The world-building continues to be incredible. 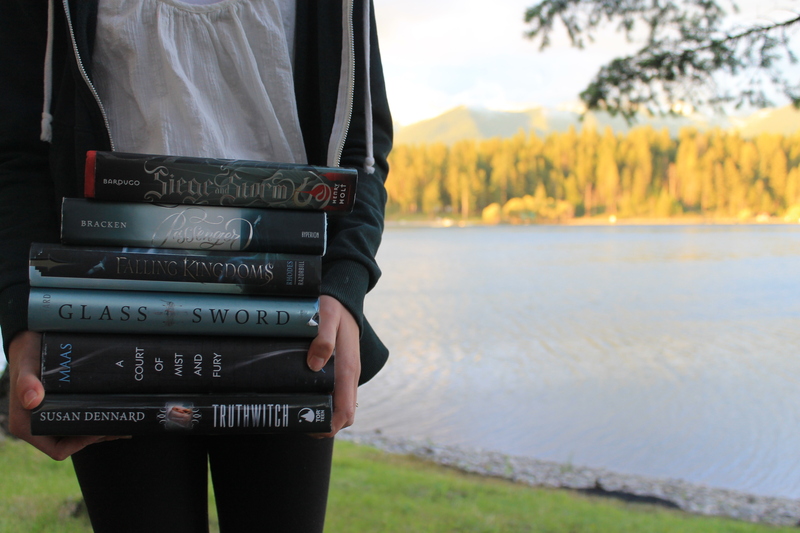 We’re in the fifth book (sixth if you count Assassin’s Blade), and there’s still so much of it. Sure, most of it was in the first few books, but there’s always room for more. 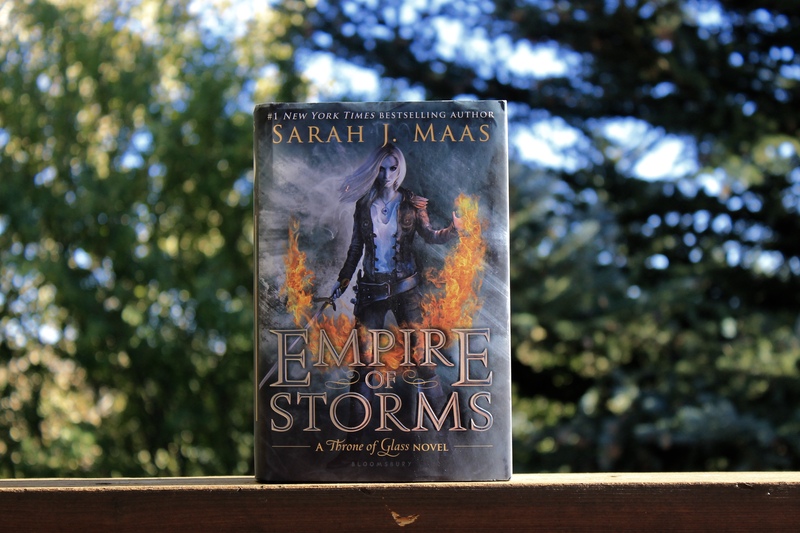 A lot of authors kind of stop with the worldbuilding after like book three, but Maas doesn’t do that. Her books are still full of great world building even this far into the series. I love that because you have a clear image of the world, and not just appearance but everything, really. I read pretty much nothing in this review because spoilers, but yay, I’m glad it’s good! There was that whole hoopla over it a few weeks ago and I was worried it was going to be absolutely horrible. Haha, yeah, that’s alright. It’s really hard to write a good review without discussing some things that happened in the book. I tried to ignore all the drama going on though, because it was mostly about stuff I didn’t care about. A lot of people gave it one star without even reading it though which made me sad. Despite the fact that Chaol was not in it and the relationship a lot of people wanted didn’t become cannon, it was still a wonderful book. I hope you enjoy it when you have the chance!